Welcome to our community website. We hope you will find it a convenient and easy way to stay informed of and become more involved in day-to-day operations at Chasselton Condominium. 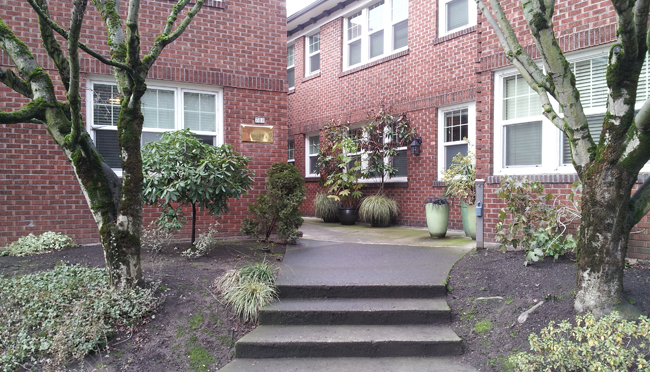 Chasselton Condominium is located in the Kerns neighborhood in northeast Portland on 28th Avenue (also known as “restaurant row”), between Sandy Boulevard and Glisan Street. In 2007, the 80 year old brick faced structure was converted from apartments to 36 individually owned, restored units. This handsome building is uniquely contained on a triangular block surrounded by beautifully landscaped grounds. Conveniently located on several Tri-Met bus lines, 12, 19, and 20, the property is also within walking distance to Oregon Park, grocery stores, and an amazing mixture of local shops and restaurants. Please feel free to explore the features available to the public on this site. If you are an owner or renter at Chasselton and have not been notified of your user name and password, kindly complete the Login Request Form. Click here to log in and gain access to resident information. Once logged in, links will lead you to legal guidelines, bylaws, rules and regulations, and documents. You will have the opportunity to review building repair/maintenance schedules, be granted access to HOA Board minutes, and be provided with a forum to make suggestions and/or comments. Enjoy this website as a resource for better living at Chasselton Condominium!